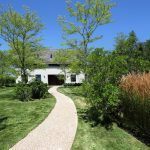 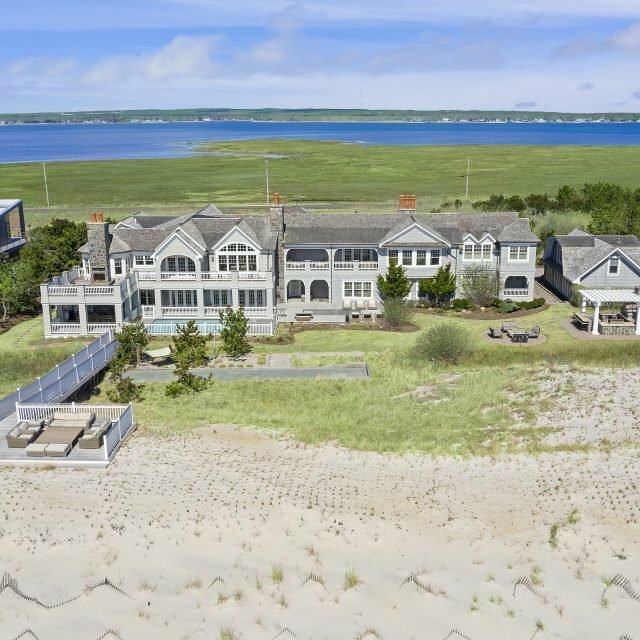 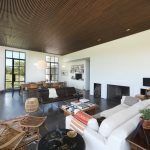 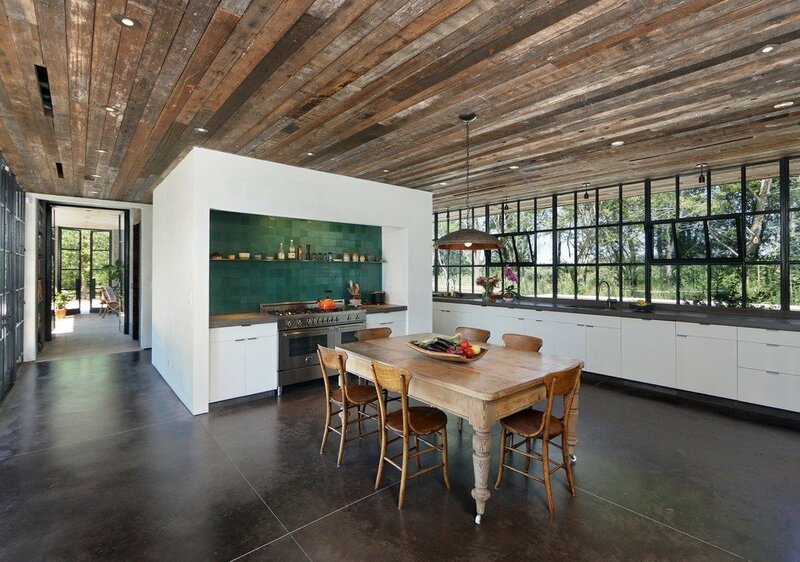 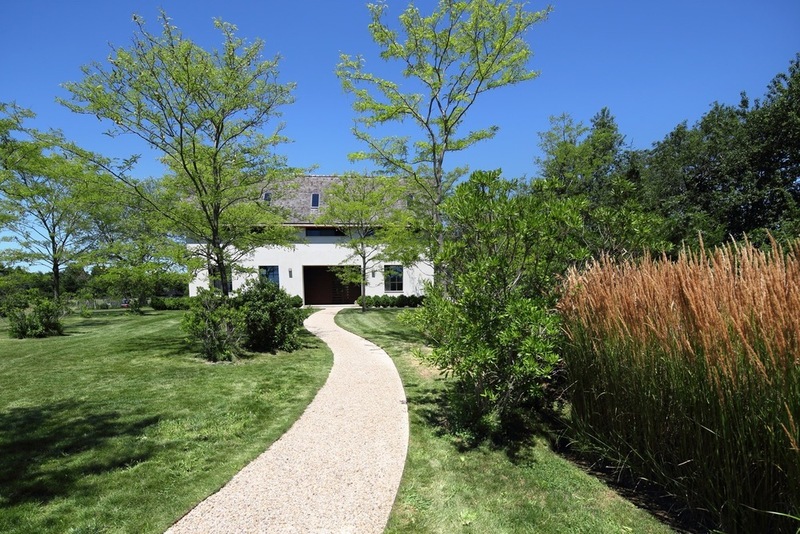 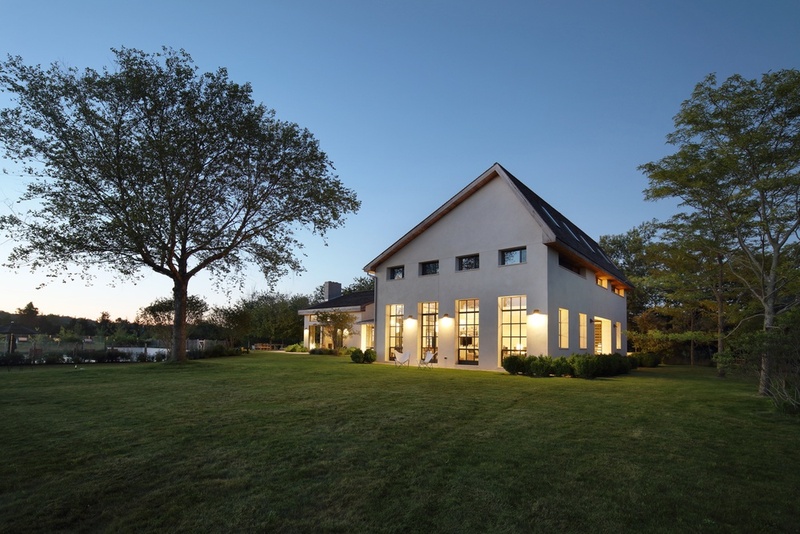 This Bridgehampton estate combines the rustic rural farmhouse with the grittiness of a Williamsburg loft. 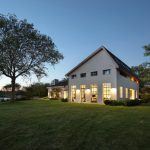 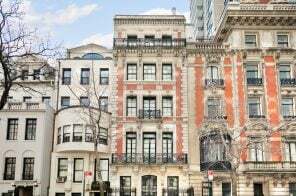 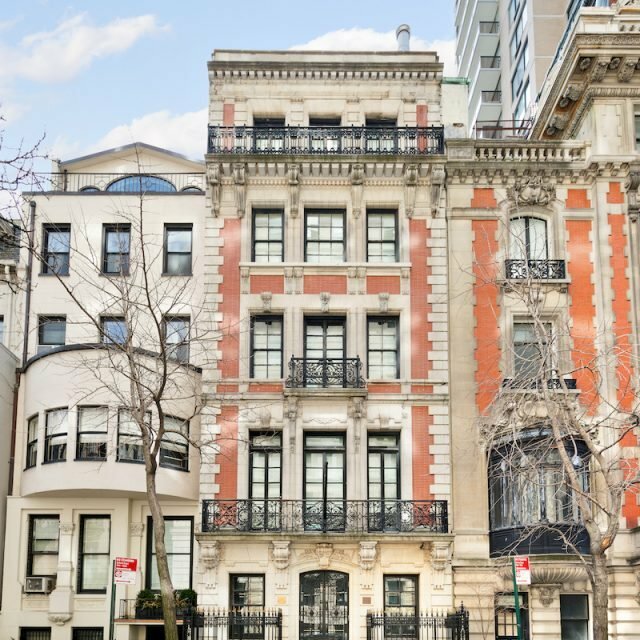 The Brooklyn-based studio TA Dumbleton Architect designed the entire property, which includes both a guest home–a project 6sqft profiled here–and this main residence. 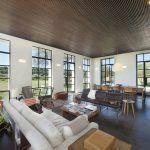 The guest home, dubbed the WE Guest House, boasts an open 3,000-square-foot layout, double-height windows and insulated stucco walls. 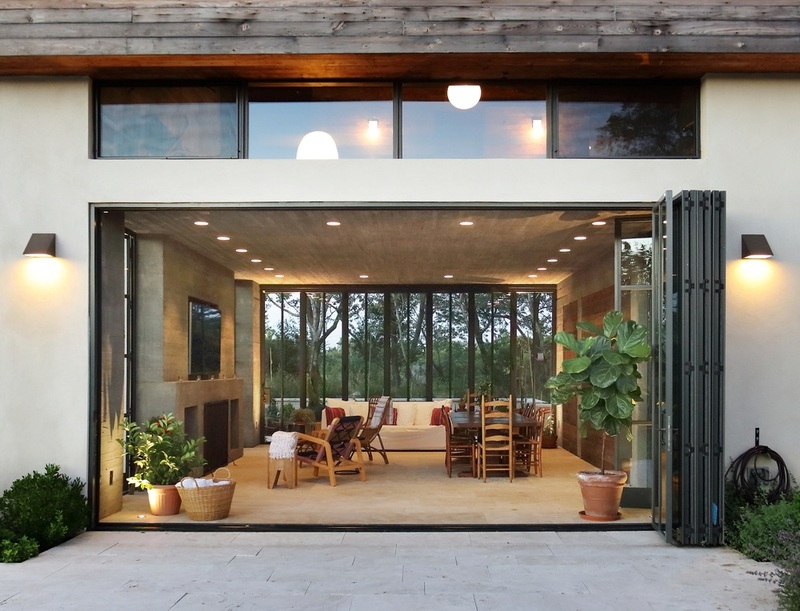 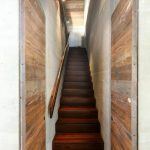 The main property, called the WE House, utilized reclaimed wood from a Brooklyn factory, board concrete and casement windows to make a strong design statement. 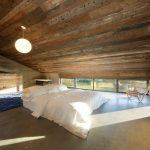 The home is made up of two volumes connected by a transparent glass and wood centerpiece. 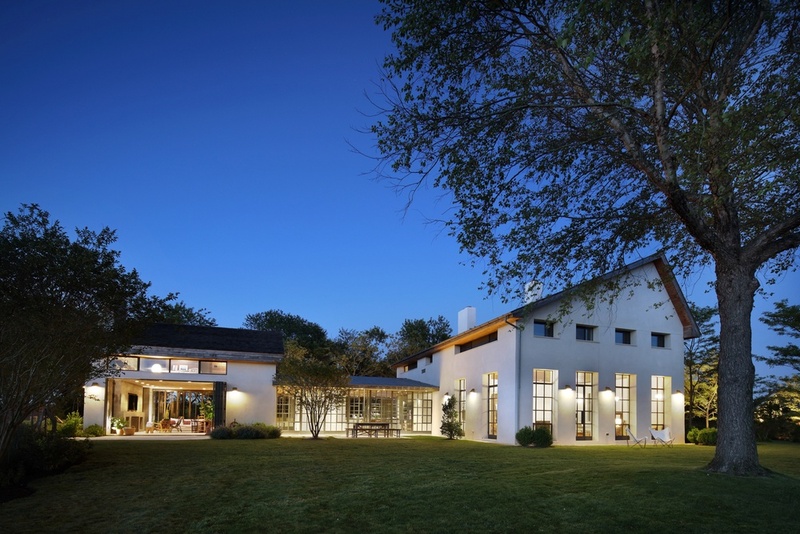 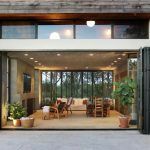 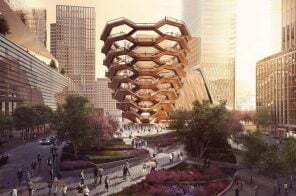 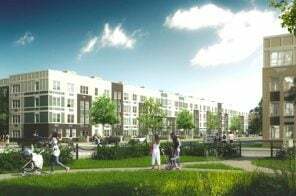 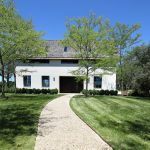 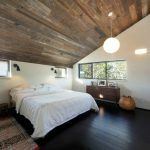 Depending on the angle, it either looks like a modern farmhouse off a winding road or a sprawling, glassy, modern abode. 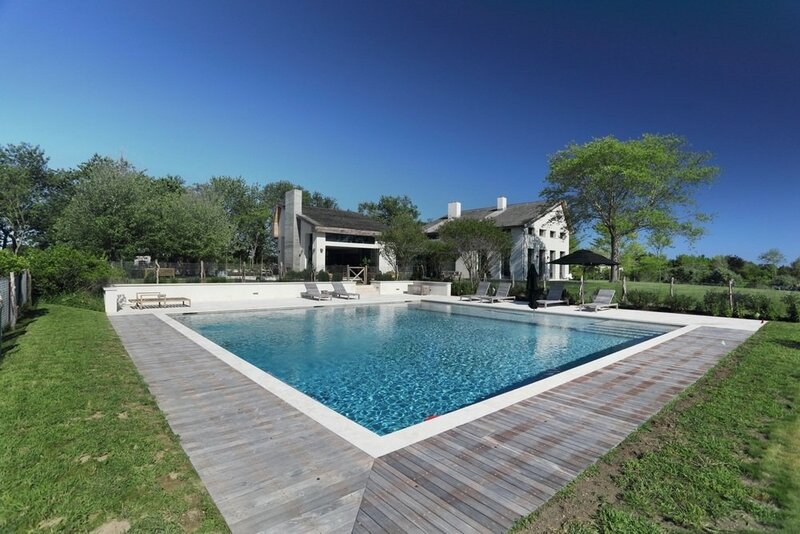 The house sits on a large property with an expansive lawn that leads to a pool. 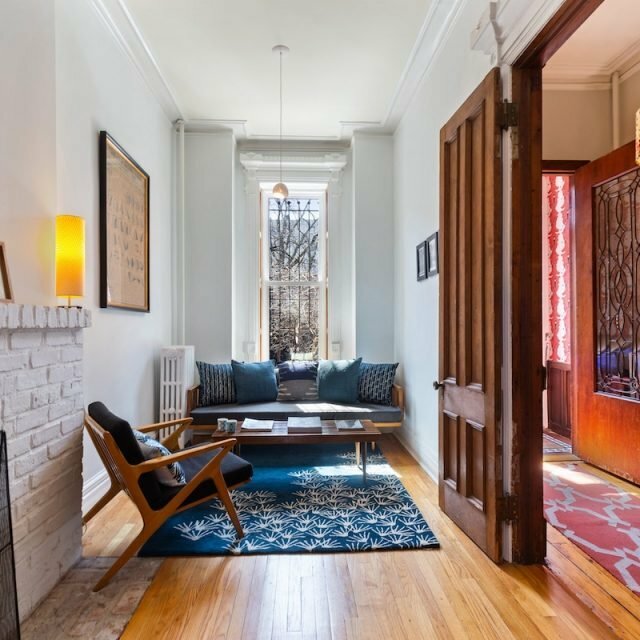 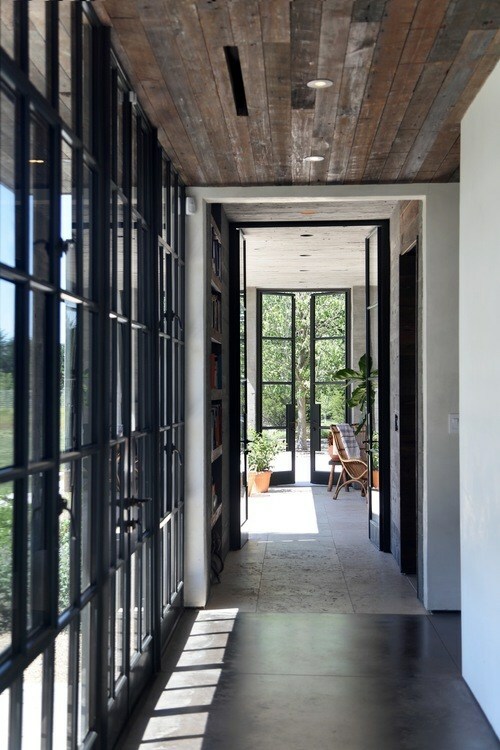 A long, narrow hallway lined with dark wood leads to an open, bright living space. 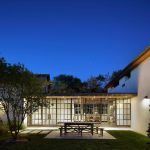 The kitchen and dining area make up the glass and wood extension, which connects both volumes of the home. 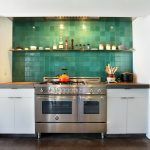 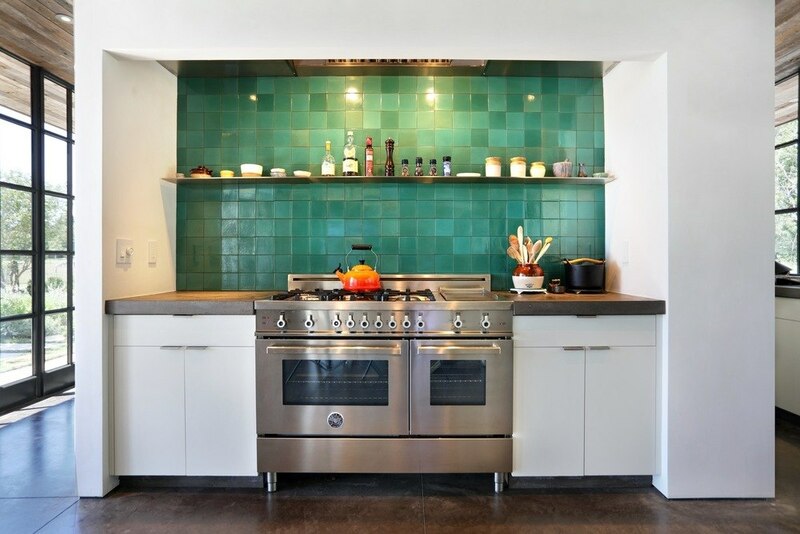 A tile backsplash in the kitchen module adds some warm color. 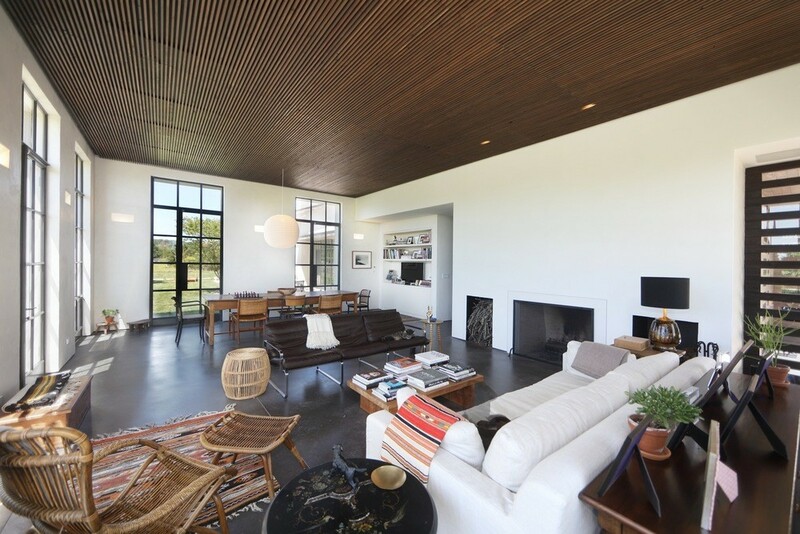 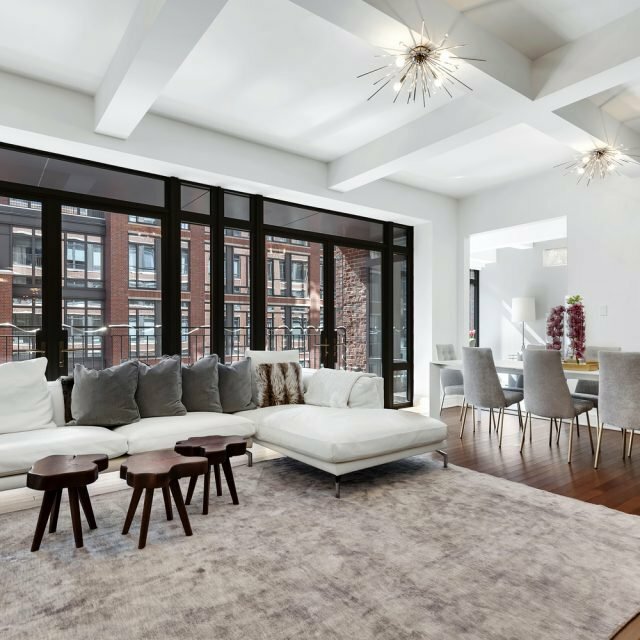 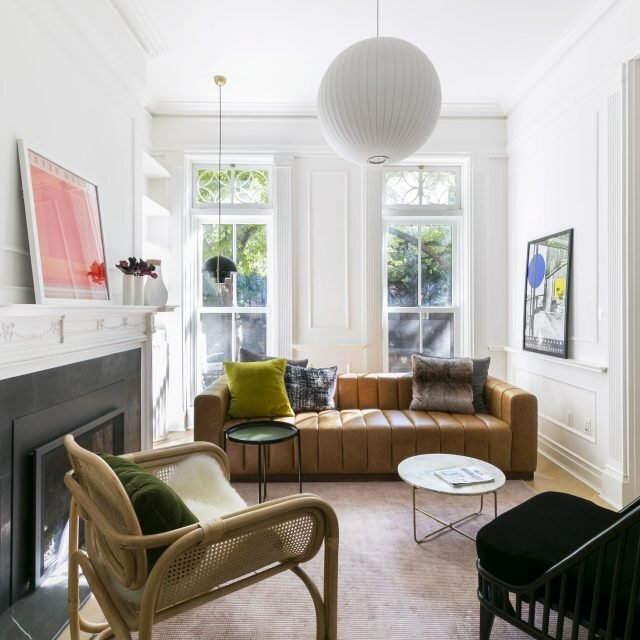 The living room, lining one end of the home, boasts a sleek, more formal wood slatted ceiling. 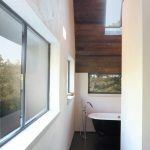 The floor-to-ceiling casement windows that surround the room give the appearance of a loft apartment. 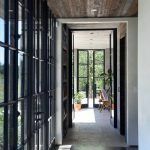 On the other end of the house, the windows fold open to create a seamless connection between outdoors and in. 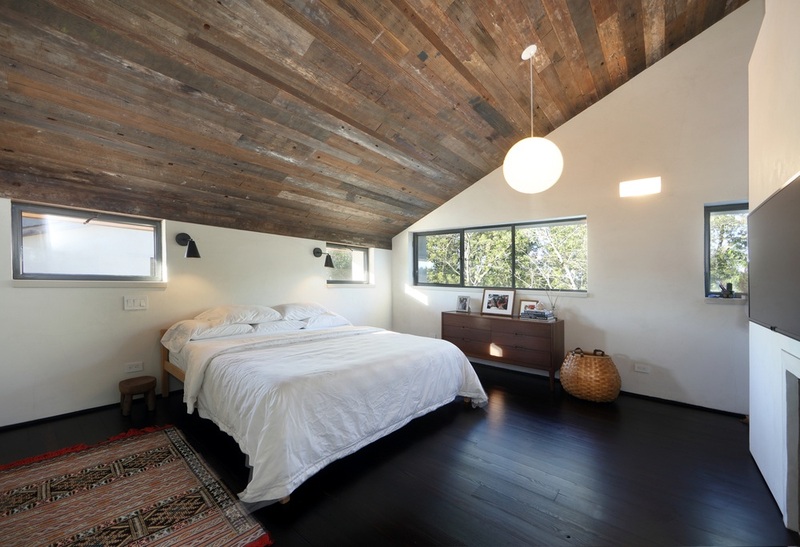 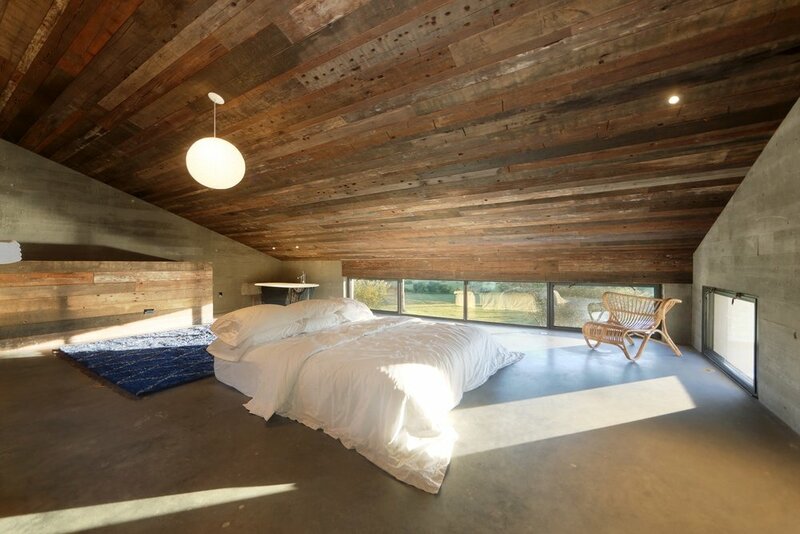 The reclaimed wood also lines the bedroom ceilings on the upper floor. 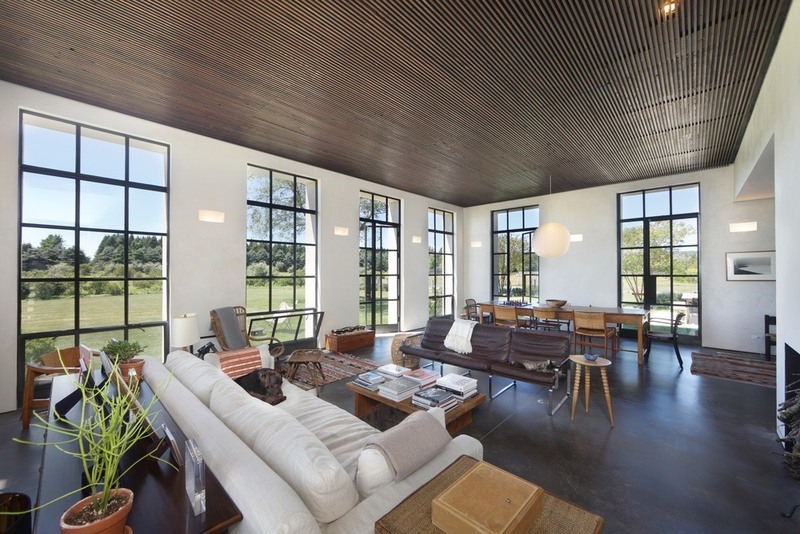 In the master, a lower-level, slat window provides a dramatic stream of light. 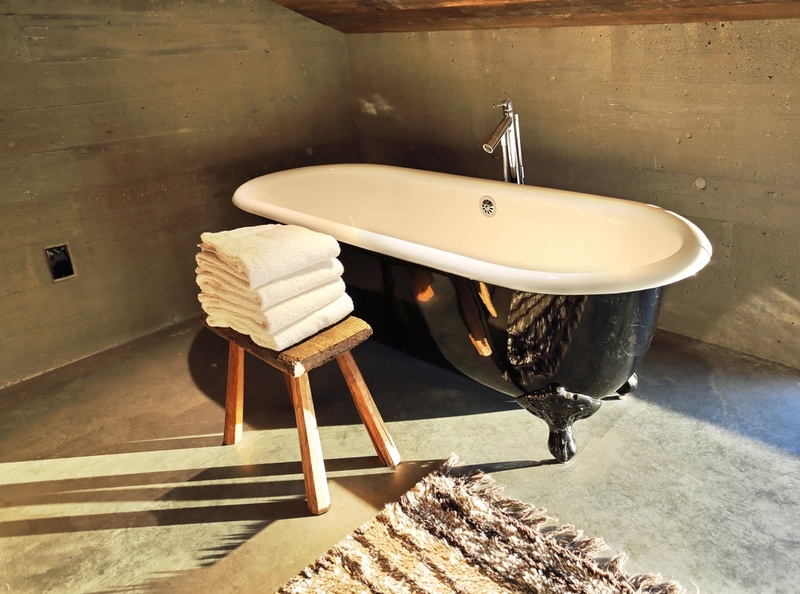 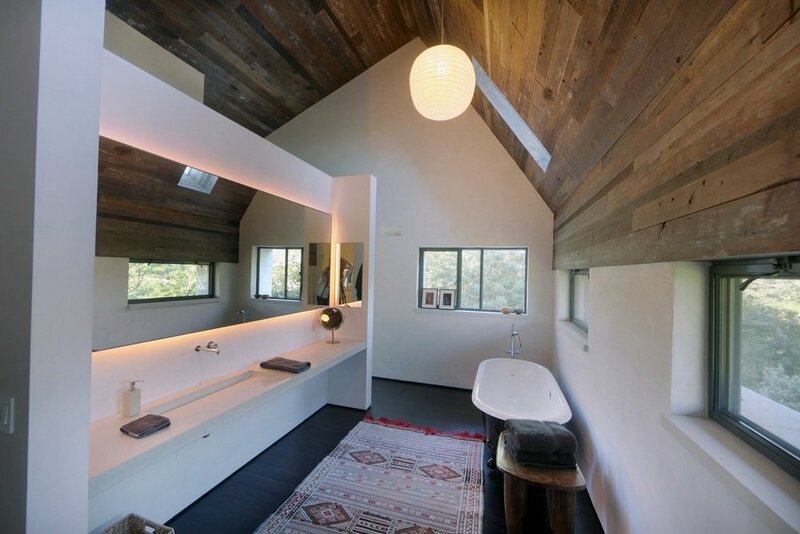 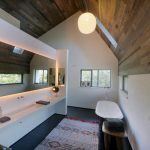 Even the bathrooms are showpieces, encased in the wood and concrete materials. 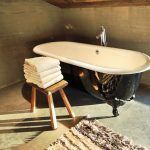 The cast iron tub serves as another reference to a loft apartment, while the cathedral ceilings look more like a farmhouse. 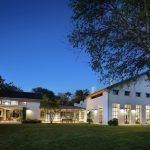 If you’re impressed by how well the architects melded the two aesthetics, be sure to check out the guest house–which is just as impressive as the main property.